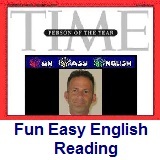 ﻿ Fun Easy English - reading practice and learning about the holiday Chinese New Year. Chinese New Year is an important traditional Chinese holiday. In China, it is also known as the Spring Festival, the literal translation of the modern Chinese name. Chinese New Year celebrations traditionally ran from Chinese New Year's Eve, the last day of the last month of the Chinese calendar, to the Lantern Festival on the 15th day of the first month, making the festival the longest in the Chinese calendar. Because the Chinese calendar is lunisolar, the Chinese New Year is often referred to as the "Lunar New Year". Although the Chinese calendar traditionally does not use continuously numbered years, outside China its years are often numbered from the reign of the 3rd millennium BC Yellow Emperor. But at least three different years numbered 1 are now used by various scholars, making the year beginning in 2013 AD the "Chinese Year" 4711, 4710, or 4650. Chinese New Year celebrations occur in communities all across America, especially place with a significant Chinese population. The celebrations can be very exciting. 1. Chinese New Year is also known as which of the following in China? 2. Chinese New Year Festival is which of the following? 3. Chinese New Year is celebrated in which of the following? 4. Within China which of the following do people not do the evening preceding Chinese New Year's Day? 5. Money is given in which of the following?